Have you ever tried to syndicate or distribute your content to another site, on social media or somewhere else? Did you ping your site? Are you going to redirect your site feed to Feed Management Service like FeedBurner? Did you implement email subscriptions for your readers? Whenever you implement those features, gadgets or deal with external services to syndicate your content, you may have been asked for your site feed URL or RSS URL. Did that question prevent you from using a particular service? So definitely may wonder how to find your blog feed or site feed URL. Don't you? Feeds are a way for your blog to distribute your content apart from site visitors. It will helps to read your content and will be delivered automatically with regular updates. Most services such as Search Engines, News Aggregators, Ping Services, Blog Directories make use of site feed to retrieve latest updates and content on your site. Blogger offers two formats of feeds in their blogs - Atom and RSS. By default, Blogger use Atom format for feeds. However you can use either Atom or RSS URL to when you need to feed address of your blog with external services. 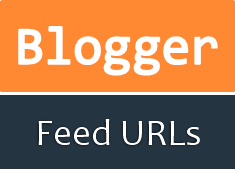 Here you can find type of feed URLs available in Blogger. You should have enabled your posts, comment or per-post feeds to use corresponding feed URLs. Read How to Change Your Feed Settings in Blogger. This is your full site feed which display your blog content. Whenever you publish a post on your blog, this feed will update in real-time. This will holds all the comments made on your blog and you can use this URL if you wanna let users to subscribe to your comments or for other purposes. Here you can obtain feed for specific label or category. Absolutely this can be useful if you gonna provide a way to subscribe for specific topic or category. Here you can obtain comment feed for specific post. If you wish to display comments made on specific post, you can make use of this URLs. Add you blog address here. Add specific label name you are interested in. Make sure to use correct label name as it is case-sensitive. Add your particular Post ID here. iii. Navigate to Posts tab. iv. Click on the Post Title or click Edit link after hovering the post you wanna find Post ID. v. Now take a look at your browser address bar. You can find the Post ID at the end of the URL displayed on your address bar, right after postID=. I've got a specific and perhaps odd request. Let's say I have a blog post at url myblog.blogspot.com/2012/05/myblogs-latest-post.html. Knowing only this url, is there any way to retrieve the post in Atom format? Thanks. I had a blogger blog for 3 years. But a while ago I left blogger interface and open a new site. While I have my old blog, I had followers (surely) so I was following few blogs to. But since I left blogger, I have to open blogger home page to read blogs which I follow. I dont want to login blogger, I want to read them through a feed reader. Could I have a rss link for "Blogs I am following" section? It would be really really great! So you need feed URLs for blogs :) Easiest way is getting feed URL via Google Reader mate. On Google Reader, point on blog title on left and a little down arrow will be displayed. Click on it and in the menu select "View details and statistics". You can find feed URL for blog there. Yeah mate, that's what I told :) However I have no idea about getting all blogs in one link. You have to do it all one by one as I suppose. [Blog Address]/feeds/posts/defaultthis (with the address of my blog) would not be validated by Technorati. Whatsup? I have a big issue with my feed. It's been about 3 months being nut to find out why my blog updates do not show up in my followers reading list in dashboard. It said that my feed url maybe incorrect. But, with that feed i can ping my articles without any problems. Did you try adding your feed address with a feed reader, such as Google Reader? If Google Reader shows your updates, then you have no problem with your feed. Also ask other followers if they experiencing the same issue. It might be a problem in distributing content for subscribed followers. In that case, you better report it to Blogger Product Forum.